After all the work we did yesterday, today was bound to be a bit of a slow day in comparison. 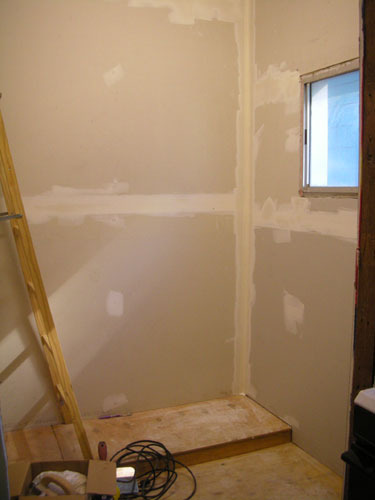 I pretty much got one real project done, which was the first layer of taping the vertical corners in the pantry. When they're dry, I can do the corners at the ceiling, and then it's a festival of careful layers of mudding. The hardest part, really, is getting up the motivation to work on it in such small increments. 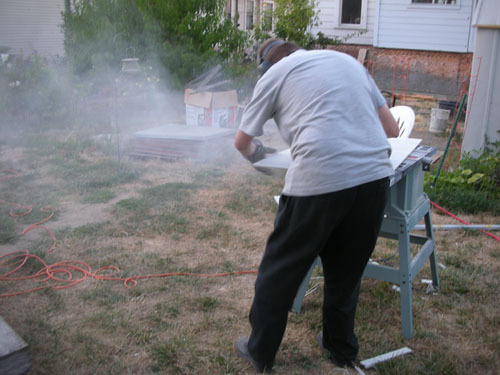 While I was doing that, Noel had his own project going on outside. Our plan for the eaves of the shed is to staple up hardware cloth, so there's a regular flow of air through there. 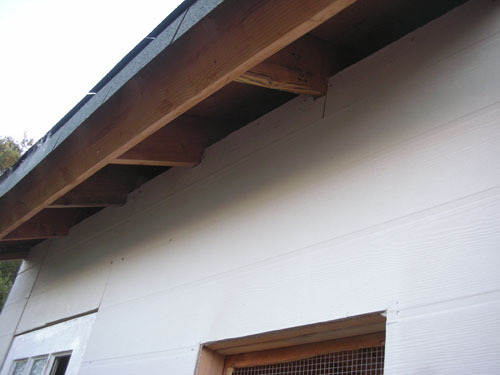 Noel just wanted to add siding up to that point, instead of having the hardware cloth return to the wall horizontally. It might have made sense to have cut the wall studs down a bit so that the walls were only eight feet tall (and no extra siding would be needed), but that seemed like a lot of work at the time. When he's done with the tiddly bits of siding, I will go around and caulk all the seams smooth (and cover the nail heads at the same time), and they will be a lot less visible. We still need to go buy material for the trim, preferably before the rainy season starts.